I was sent this tasty treat from Briana @ EFG. Thanks Lady. It was packaged in that pretty box with pink bow. Inside were decorative packing ribbon and iridescent hearts. It screamed Valentines. This Pomegranate Cosmo is perfectly made. I have a habit of over pouring the liquor when mixing drinks. This comes fully made so there's no room for error. You just chill, pour and ENJOY!. I invited my neighbor over to sample this Cosmo with me and we both determined it to be one of the best drinks we've had. It's 14% alcohol by volume so just slightly stronger than my normal glass of wine. It's fruity, but not too much so, and was a nice change to our normal wine sipping. VnC cocktails are the brainchild or entrepreneur Shane McKillen who was tired of spending all his time mixing drinks at parties. He created VnC in 2007. All the ready-to-serve cocktails contain 100% natural fruit juice and NO preservatives. 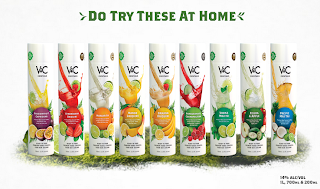 They are made with 13.9% New Zealand Vodka or Premium Tequila and are all 150 calories or less per serving. Whether celebrating Valentines Day, a special occasion, or just to get together with friends. 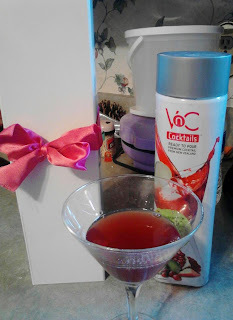 Let VnC do the work, You can spend your time enjoying the company. There's something for everyone and your guests will enjoy your company as much as they love the drinks you're serving.